El Potrero Chico (EPC) is without a doubt one of North America’s premier winter climbing destinations. In the winter of 2018-2019, I was able to spend over a month down at EPC enjoying everything that the it had to offer. I have to tell you, this place has it all. What stood out for me in particular about EPC was the sheer quantity of super accessible multi-pitches and the strong climbing community. EPC sits uniquely close to the USA, meaning that there are a lot of seasonal travelers here looking to escape the cold from the north. This combined with cheap Mexican living and a slow pace of life makes it an excellent location to go for a short vacation or stay for the whole season. Check it out, you don’t be disappointed. Where Is El Potrero Chico? Is El Potrero Chico Safe? the introduction to the area, why you should go, the logistics of how to get to EPC, and advice on getting supplies and restaurants for once your there. El Potrero Chico – Ultimate Climbing Guide Part 2 covers information on the climbing, what to bring, and where to stay. I hope you find this information useful. Why Go To El Potrero Chico? El Potrero Chico a world class sport climbing destination. There is a huge amount to climb here at every grade. EPC actually has one of the largest selection of “moderate” (5.9-5.11a) climbs in the world. And if that is too easy for you, nearby El Salto has emerged as one of the world’s premier steep limestone crags, with large quantity of 5 star lines starting at 5.11+ going all the way up to 5.14+. As I mentioned before, EPC has some of the easiest and most accessible moderate multi-pitches in the world, many with almost non-existent approaches. In addition, most of the more difficult classics are aidable, meaning that anyone who can comfortably lead 5.10 will have a lot to choose from. Also, as you might imagine, it is very cheap once you get here. If you’re camping it is easy to comfortably live off around 10$ a day. A true dirtbag’s delight. The climbing community here is also super strong, one of the best I’ve ever seen. Meaning that if you happen to be traveling alone, you will have absolutely no problem finding someone to climb with at pretty much any grade. Oh, and did I mention that climbing here is great? And there a style to fit almost anyone’s tastes. Though sometimes EPC can be chossy, most of the well-traveled routes are bomber, just be sure to wear a helmet while climbing here, as rocks get kicked off from the multi-pitched above regularly. Not to mention, in winter the days are dry and crisp, making for perfect temps. In the shoulder seasons things heat up, but once you learn where the shade is you can pretty climb here every day October to May, even longer if you’re keen. Located in one of Mexico’s most northern states: Nuevo León, EPC sits about two miles outside of the town of Hidalgo and about 45 minutes away from the state’s largest city: Monterrey. Hidalgo itself isn’t much to look at, but it is surrounded by stunning mountain views that can’t help but make a climber smile. Mexico has gotten a lot of bad press from the drug cartels over the past few years, especially the border states (like Nuevo León). However it is the general consensus of the climbers and locals alike the the Narcos have no reason to be in Hidalgo. Serious crime is rare here, and it is considered safe for travelers. There is also a very high police presence here, and they are constantly patrolling the climbing areas. Keep in mind, that with any foreign country, exercise heightened caution and use your own judgment. The US embassy has an excellent page and interactive map where you can decide for yourselves. Most of you will be coming from the Monterrey International Airport (MTY). This is located on the outskirts of Monterrey City, and is about a 45 minute drive from the town of Hidalgo. You technically have two options to arrive to town, bus or taxi/Uber, however, the bus to Hidalgo takes 2.5-3hrs (if you know where you’re going) and will take a relatively high level of Spanish, as most people from Monterrey will have no idea where Hidalgo is. If this is your path, take the bus from the airport direct to Hidalgo’s transport terminal. From here you will be able to ask for direction to the local bus to town. This will cost you about 3$ USD. Now if you’re coming by Taxi/Uber, this can be taken directly from the airport. Uber is the easiest and cheapest option. If you don’t have international data, you can use the free wifi in the airport to order one. The cost is 525-600 Mexico Peso (MXN). If you want to go by cab, they have a number of automated kiosks where first type in where you’d like to go, and the cab will arrive a few minutes later to take you to your destination. This costs 650-700 MXN. To return to the airport to MTY, you can either navigate the local bus system, or hire a cab as there are zero Uber drivers in Hidalgo. The easiest way to do this is to ask at any of the campsites, as they all hire their own taxi services. This costs around 1000 MXN. You can also ask at Leo’s or El Taco Loco, as they provide taxi services as well. Their rates are more economic, as they charge around 600 MXN. I would suggest posting on EPC’s FB page a few days before if you’re hoping to split the costs. It is also surprising common for people to drive down to EPC from the US. The closest border is only about 2.5hrs away. Not a bad way to save a few dollars is to first arrive in Texas, then take a Greyhound to Monterrey. The costs about 35-50 dollars each way, depending on where you are coming from. So there are a few logistical things that you should be made aware of to both help save you money and time. This includes the beta on the supermarkets in town, ATMs and the local street markets. I’ve also included some info on the popular restaurants. The town of Hidalgo has two weekly street markets. 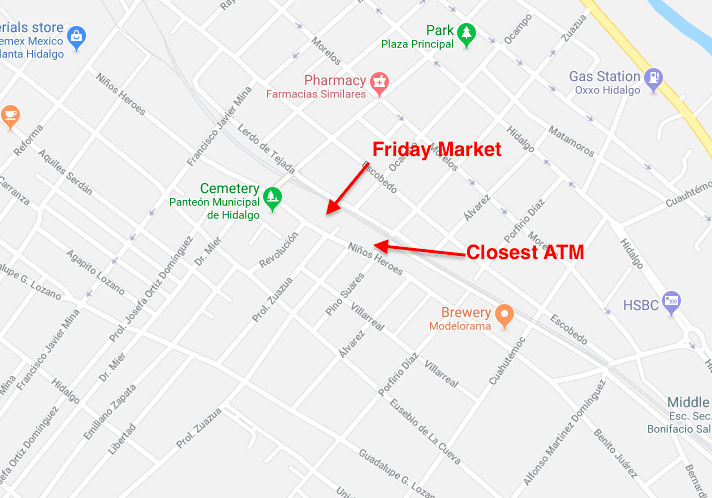 The first being held every Friday (and is therefore called the “Friday Market”), and is located on Calle Niños Heroes, right next to the police station (which happens to be the location of the closest ATM in town). Here there is a nice assortment of fruits, vegetables and street food. The prices are slightly lower than the local supermarket. The other market, referred to as the “Tuesday” market, is on the outskirts of town on Calle José Domínguez, and about a 10 minutes walk closer to the climbing than the Friday market. This market is also larger, and has lower prices than the Friday market. For that reason it is an excellent idea to plan your shopping around days around this one. 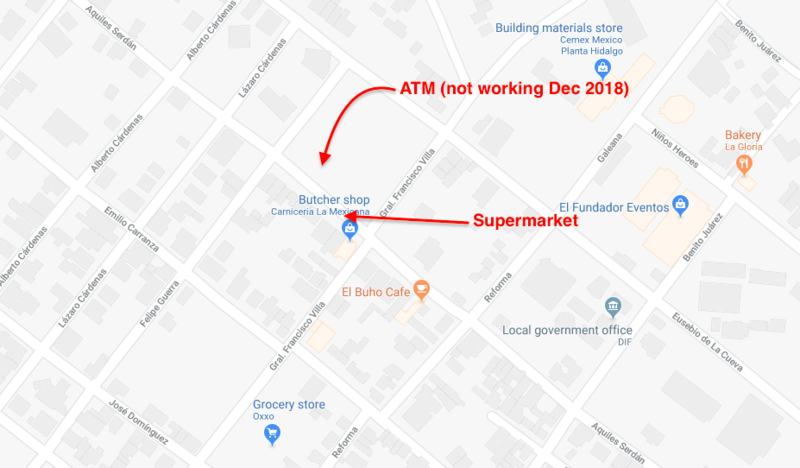 I would like to point out, that both of these markets are very “local” meaning that they are not the place to go if you’re looking for Mexican souvenirs, only food and other household items. Actually Hidalgo is in no way a tourist town, meaning that if you’re looking for souvenirs you’ll most likely have to venture into Monterrey. The street markets are great for getting fresh foods, but for anything packaged you’ll have to take a trip to one of the supermarkets in town. The closest supermarket is located on Calle Anquiles Serdán and has a small but good selection. Also,they accept credit cards, which is nice. If you have a car, or if you’re willing to walk a bit further, I suggest going to Bodega Aurrera, as it has a much larger selection and better prices than the aforementioned market. As we all know, Mexicans make some of the tastiest food on the face of the planet. So for that reason, I have assembled a small list of some of the best food options nearby. Located across the street from La Posada, Checho’s is probably my favorite food near the campsites, Chechos has an good selection of local food. The mole sauce is out of this world. Closed on Sundays. Selling food in the parking lot of the canyon, Edgarado sells fresh baked pizzas made to order. An absolute must go for any climber. He also has a great selection of microbrews and without a doubt the best margaritas in town. He also sells climbing gear and t-shirts. What a legend. Located near the police station, on the same street as the Friday market, Tamales Esperanza offer the most delicious and cheap tamales in town (only 7 MXN each). The bean tamales are the way forward. El Buho is the only proper cafe in town, offering great locally sourced coffee and a good range of food. They also have a pile of board games, climbing magazines and multiple bookshelves to keep you occupied on your rest days and not to mention some of the friendliest staff around. It’s also a great place to meet people from the climbing community. They have a regular social events, such as barbecues every Tuesday night. This guide was too big to fit into one article! And I saved the best for last. If you want to read more about some of EPC’s best routes, what you need to bring, and where you should stay. For part two of this guide see: El Potrero Chico – Ultimate Climbing Guide Part 2. For further reading see: “Northern Ecuador’s Best Rock Climbing” and “Trip Report – La Mesa de Los Santos – Santander Colombia“.